THE HIGHEST VALDOBBIADENE PROSECCO SUPERIORE DOCG IN THE ENTIRE WORLD? 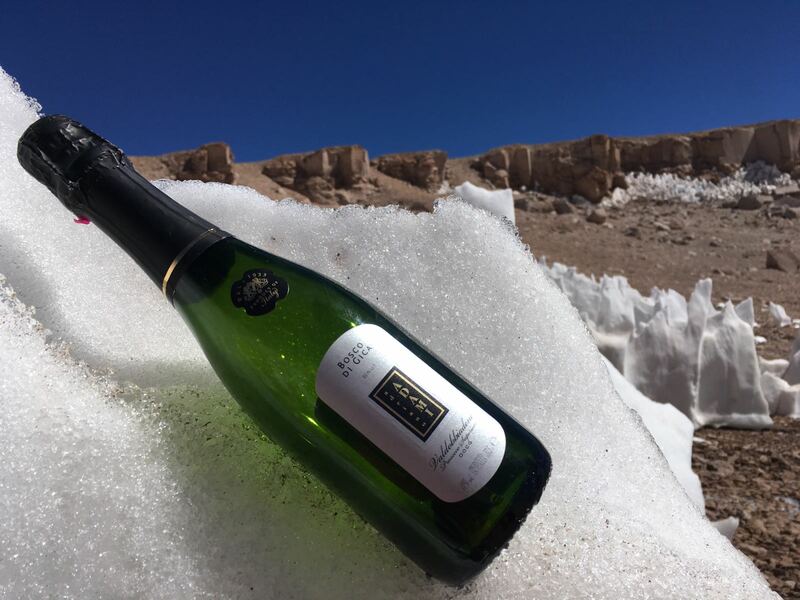 After having conquered the highest peaks and volcanoes of Africa (Kilimanjaro, 5,895 metres), Europe (Monte Elbrus, 5,642 m), and North America (Pico de Orizaba, 5,636 m), Bosco di Gica Brut Valdobbiadene Prosecco Superiore DOCG, just before Christmas, planted its flag on the summit of the world’s highest volcano, Ojos del Salado in Chile, at 6,893 metres’ elevation. Ojos del Salado rises in the Atacama desert, a totally uninhabited area that is drier than the Sahara, but at Himalayan elevations. 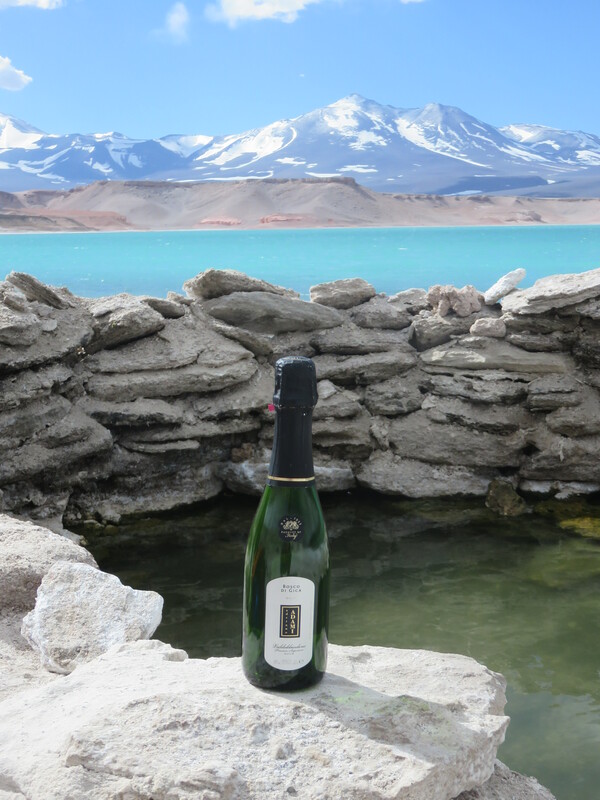 Located in northern Chile, between the Cordillera of the Andes and the mountains along the Pacific coast, the area is 100 million years old, 50 times drier than California’s Death Valley and has absolutely no oases. There is really no other place like it in the world! An extreme place, recalling some of the extreme vineyards in the Valdobbiadene DOCG zone. A place whose peak can be conquered only with great effort, determination, and passion. In a word, the same tenacity, perseverance, and commitment required to produce Valdobbiadene Prosecco Superiore DOCG, growing vines on those high-rising, ultra-steep Rive. “The idea of bringing along with us a bottle of Adami Valdobbiadene Prosecco Superiore DOCG on each challenging climb, recounts Enrico Valleferro, “came by chance in 2013, when my climbing companion Carlo Padoin and I brought Vigneto Giardino Asciutto Valdobbiadene DOCG Prosecco Superiore Rive di Colbertaldo with us to Kilimanjaro, to celebrate the harvest of that venerable Adami cru wine. And so to 2016: “Heading into the desert to climb mountains already seems like quite a paradox. We all think of deserts as places with dunes, sand, camels. But in the Atacama desert, the vicuña—a kind of llama-takes the place of camels; the sand is there, but mixed with rock, ice, snow, and penitentes—tall, thin columns of snow or ice, present only in South America. Another interesting fact is that the desert lies at 3-4,000 metres’ elevation, with peaks almost reaching 7,000 metres! Truly an unusual, intriguing spot, with salt-water ponds that attract migratory birds—flame-red flamingos, for example–; hot, relaxing volcanic springs at amazing elevations; and volcanoes and mountains as far as the eye can see. “After months of training and preparations, we finally left on 8 December,” says Diego, “for a long and eagerly-awaited journey. On the 10th, we met up with our group and our guides, and immediately became part of a wonderful, warm-hearted, multi-cultural atmosphere. There was Connie, a dynamic Canadian climber; the out-going Darwin, from New Mexico; our other-side-of-the-Alps cousin Alexandre; and Jürgen, a great German climber. Group leader Guillermo and his team, Alberto and André, inspected the equipment and explained the programme, which involved jeep transport and various high-elevation climbs to acclimatise us. So in 10 days, we went from sea level to Camp 5– Refugio Tejos, at 5,800 metres—passing through interminable valleys, up wind-swept peaks, and over boundless landscapes, all with absolutely breath-taking, panoramic views. “Tuesday, 20 December, in Refugio Tejos, we woke up at 1.00am and departure was at 2.00. I only remember the cold and sleepiness—a symptom, at high altitudes and extreme conditions, of being tired,” comments Enrico. “There was total darkness, and our headlamps lit only a few metres in front of us. That moment before dawn was the worst: intense cold, with a freezing wind to accompany our slow, but steady steps upward. I could hardly wait for the sun to appear, hoping for a bit of heat, maybe not very warm but at least psychologically effective! At 10.00am, after a series of quick zig-zag climbs and traverses over icy snow with crampons, we reached the crater. But that wasn’t the end, since rearing up in front of us were another 150 metres to climb. 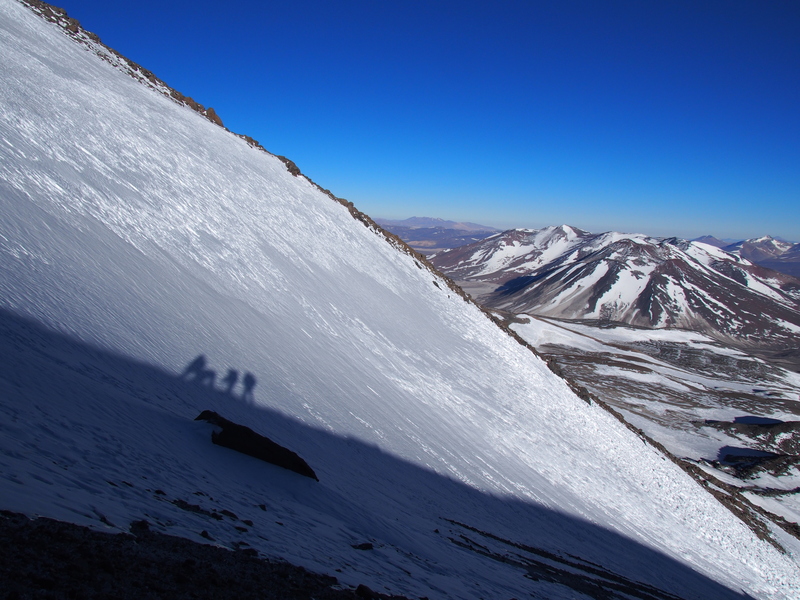 First, we traversed an almost-vertical channel that was a horrible mix of rock, sand, and ice, then climbed up some 20 metres, and finally we crept along a crest that wasn’t overly narrow but certainly was scary—at almost 7,000 metres, with Chile on one side and Argentina on the other. We prudently took it slow, stopping to breathe in the rarefied air every fourth step. Any false step here would cost dear! “At noon, we reached the top! 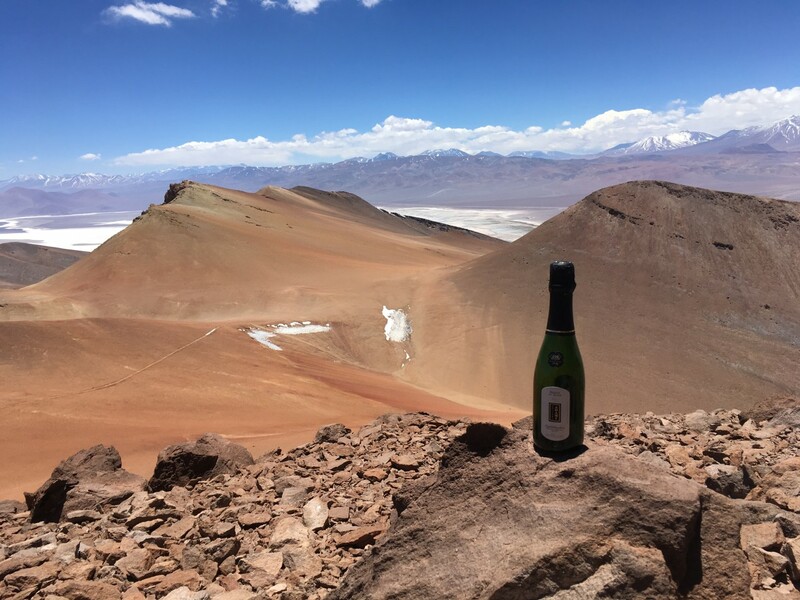 6,893 metres and our bottle of Bosco di Gica, with the entire American continent beneath us (only Aconcagua is higher than we were, by 69 metres). We hugged each other and took photos. We couldn’t believe we were there. For me it was an incredible emotion and the culmination of an almost-impossible, but stubbornly-followed dream! 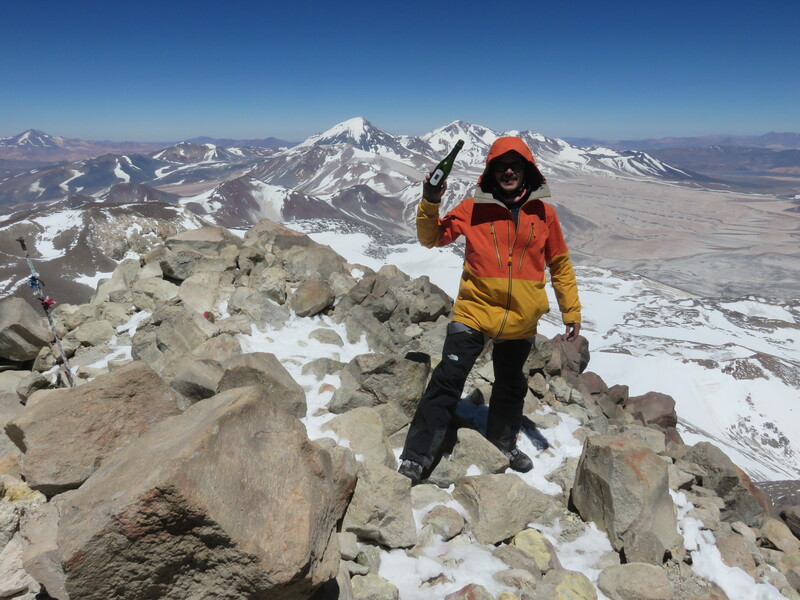 “At 7.00pm, we had safely descended to Camp 4, Refugio Atacama, at 5,200 metres. What a day it had been: 17 hours of “walking,” in conditions that zoomed from extreme cold to the afternoon warmth, from expected uncomforts to a meal-table with hot food. 36 hours later, we were on the beaches of the Pacific Ocean, and after a restorative bath, we threw ourselves into a catch of fresh fish. What an adventure, what diversity, what an experience! “Returning from such unique and special journeys, one realizes how truly enriching it is to experience different cultures and places. Discovering others’ traditions, customs, and ways of thinking is simply fantastic. “I have always felt a passion for climbing mountains—it’s a “weakness” that runs in our family!–, but as I say above, one still needs a lot of determination and tenacity as well. That is the fundamental link, the bond with the “heroes” who work the vineyards on the Rive del Valdobbiadene Prosecco Superiore DOCG: determination. I have personally watched these “heroes” at work, with incredible efforts, commitment, tradition, pride, and satisfaction at the end to see the fruits of their work. Fruits that we had the good fortune to share, in our toasts with Valdobbiadene Prosecco Superiore DOCG. “Long live the Rive!” were Enrico’s concluding words.